Paving the way for transforming the world's measurement system, an international task force has determined updated values for four fundamental constants of nature. 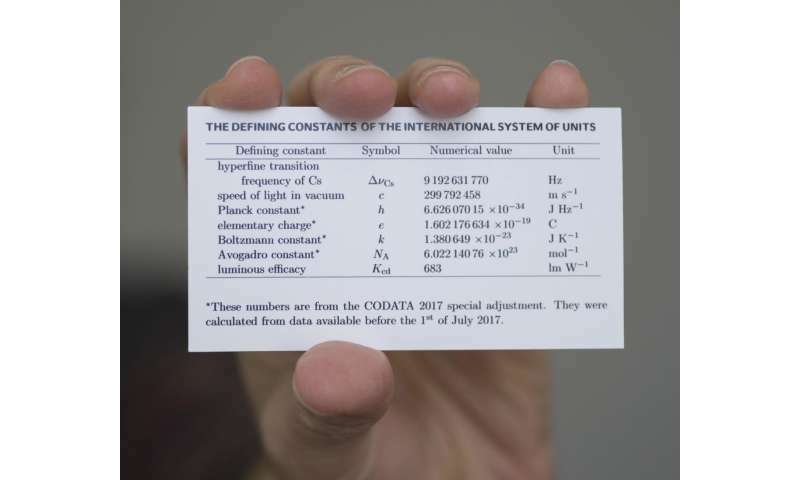 The updated values comprise the last scientific piece of the puzzle for redefining the modern metric system, known as the International System of Units (SI). If approved by an international body next year, the revised SI will enable authoritative measurements to be made anywhere on the planet. The adjustments to the constants are small and won't affect everyday life. But a revised SI based fully on accurate values of these constants underpins science and commerce and ensures uniformly precise measurements that scale smoothly from almost infinitesimal to enormous. Based on state-of-the-art measurements from scientists around the world, the updated values of the constants were prepared by the Committee on Data for Science and Technology (CODATA) Task Group on Fundamental Constants (TGFC). A paper containing the new values has been accepted for publication in the journal Metrologia. On October 20, the International Committee for Weights and Measures (CIPM) submitted a resolution recommending the redefinition of the SI to the General Conference on Weights and Measures (CGPM), the official body that makes changes to the SI. In November 2018, the CGPM will formally vote on the adoption of the revised system. The CGPM includes members from dozens of nations, including the U.S. and other signatories of the Convention of the Meter, the 1875 treaty that standardized measurement units on the international level. In the world of measurements, an SI based on fundamental constants will bring about a shift. Up until now, the CODATA TGFC updated values of the constants every four years, most recently in 2014, and produced this special update for the four constants this year in anticipation of the updated SI. "The values of these four constants won't change anymore," said Peter Mohr, a scientist at the National Institute of Standards and Technology (NIST) and a member of the CODATA TGFC. The values will be fixed and stated as exact values, he said, just as the speed of light is currently defined as an exact value. This in turn will allow scientists to focus on measurements that compare other important quantities to the constants. Together with previously accepted constants, the updated values would redefine the SI's seven base units, which include the kilogram (the unit of mass), the kelvin (the unit of temperature), and the ampere (the unit of electrical current). Since 1889, the kilogram has been defined by a platinum-iridium cylinder stored in France, known as the International Prototype of the Kilogram, or, "Le Grand K ." Scientists from around the world have had to travel to France and compare their countries' copies of the kilogram to the original in order to establish accurate mass measurements in their nations. Meanwhile, temperature has been defined in terms of the "triple point" in a sealed glass cell of water. The triple point is the temperature at which water, ice and water vapor exist in equilibrium. However, the water in these cells can contain chemical impurities that can shift the triple point temperature to inaccurate values. And measurements of temperatures higher or lower than the triple point of water are inherently less precise. The updated constants include the Boltzmann constant (which relates temperature to energy), and the Planck constant (which can relate mass to electromagnetic energy), the charge of the electron and the Avogadro constant (the quantity that defines one mole of a substance). "There are no dramatic changes. The Boltzmann constant is very consistent with earlier values," said Mohr. "The temperature experts requested eight digits for the constant and the last digit happened to be 0," he recounted—an amusing situation for metrologists since they can obtain the precision of eight significant digits by only having to use seven. "There are a variety of ways of determining temperature but the new definition will be very useful for measuring very hot and very cold temperatures far away from the triple point of water," said NIST's David Newell, chair of the CODATA task group. The Planck constant has shifted downward by 15 parts per billion from its earlier value, due to new data collected since 2014. The Planck constant was determined by two experimental techniques, known as the Kibble balance and the Avogadro method. All of the measurements that were used for determining the new Planck value met previously agreed-upon international guidelines for levels of accuracy and consistency with one another. The Planck constant can be used to define the kilogram, and using a fundamental constant for defining mass will solve many problems, Newell said. Mass must be measured over a very large scale, from an atom to a pharmaceutical to a skyscraper. "At the low end, you currently use one type of physics to determine mass; at the high end, you use another type of physics," he said. But the Planck constant will provide a consistent way for defining mass across all of these scales, with whatever laboratory method is used to measure mass. "It doesn't matter what method you use. A constant is a constant," said Mohr. The dream is to use the Planck constant for mass in the same way that light is used to measure distance. In the SI, the speed of light is already used to define the meter, the unit of length. "You use light to measure the distance to the Moon or the distance between silicon atoms," he said. The move to a revised SI is intended to be seamless for just about everyone in the world. "The whole thing is geared to not have any impact on the average person," Mohr said. But an SI based on the new constants is expected to change the world of metrology. Le Grand K in France will no longer exactly define one kilogram. Instead, it will likely have a mass of slightly less or slightly greater than one kilogram, to within 10 parts per billion in uncertainty. The volt will change as well, since the Planck constant will also help to define it in the revised SI. A volt based purely on the fundamental constants will be very slightly smaller, about 100 parts per billion, than the current scientific realization of the volt, established in 1990. So, the top-level metrology labs will have to recalibrate their high-precision voltage measurements. "People doing such high-precision measurements will notice the shift," Mohr said. That's why the official rollout of the revised SI is slated for May 20, 2019, on World Metrology Day, to give high-end metrologists time to adjust to the new values. "It's a broader philosophical paradigm shift," Mohr said. "When the speed of light became a fixed number, researchers stopped measuring the speed of light. They focused on realizing the meter. It's the same with the Planck constant. You're not going to be measuring the Planck constant anymore. You're going to be realizing mass and electrical standards more precisely." But these are based upon a funny definition of the Kg.